I just had a fantastic weekend! Earlier this week, my husband told me he had a surprise. Now, when he says this, it could be anything. My mind went wild thinking that he would say, "Surprise! Here is a candy bar!" or "Surprise! Let's go to dinner!" - what could this surprise be?! I was just excited that he planned something, but what he planned was beyond my expectations! Thursday evening, I was told to pack a bag with my bathing suit/warm weather clothes, hiking gear, warm clothes for cold and rain and dress clothes. With clues as vague as that, my mind was left to wander, but I did as he said. Friday after work, we hopped in the car and headed north. That ruled out my thoughts of Portland, but still left several destinations that I had pondered. When we crossed over the Canadian boarder, I was sure that we were going to Vancouver for the weekend. My husband kept driving past the Vancouver city limits and my mind was racing. 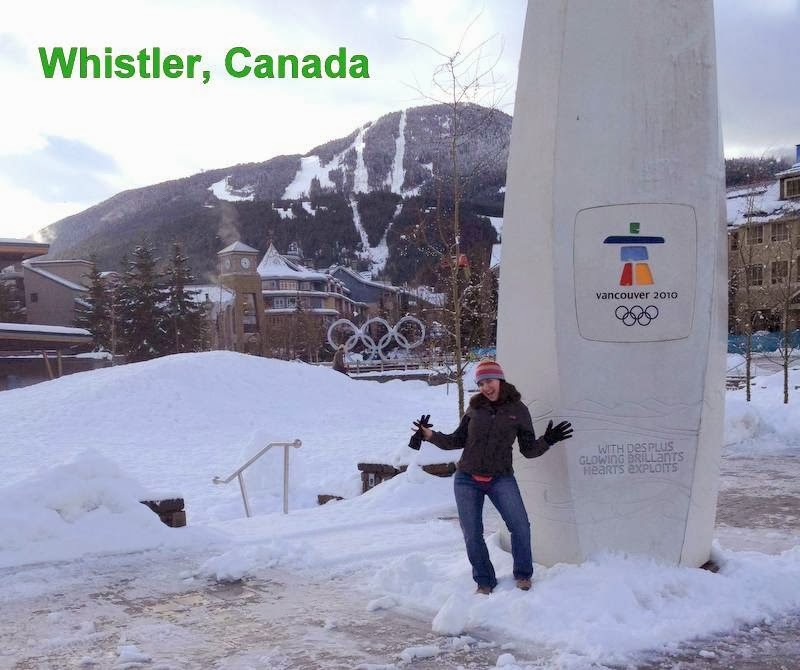 Eventually we came to the Winter Resort in Whistler, Canada. Now here is something that you may not know: I love the Olympics! My time is occupied by watching every event that I can every 2 years when the Summer and Winter games are on. Whistler was the home of several events at the 2010 Vancouver games. I am striking my best Olympic pose.